The touch screen software Xmeas is based on the the RationalDMIS, which is developed for the portable touch screen interface. Users do not need to install any new software, only need the RationalDMIS dongle to activate. The Xmeas touch screen coordinates measuring machine software is optimized for the touch screen operation, users can only use the touch screen to complete all operation. The Xmeas software simplify the complicated measuring operation, combining the most common function of the measuring process, users can achieve fast and automatic measuring in the Xmeas windows. Double screen display, data sharing, increase the working efficiency. The main screen of RationalDMIS and the Xmeas interface are displaying different interface, the data can be shared. Increase about t 30% working efficiency during the measuring process. In the Xmeas users can achieve the function as: machine homing, touch proba AB angle switching/auto checking, coordinates system fast creating/switching, element measuring, constructing, tolerance evaluation, unit switching, report output, automatic printing, reduce the time of the users running between the machine and PC, increase the measuring efficiency. Full touch screen operation, support soft keyboard typing. The Xmeas remote operation software has simple and intelligent interface, auto detecting the measuring element, automatically calculate the tolerance/construction. It is with simple operation, users only need about one hour training to manage the operation with the Xmeas. Coordinates measuring machine: users can choose wireless or wiring touch screen, the operator is able to use the Xmeas directly beside the machine, to achieve the common function as element measuring, basic construction or tolerance calculating etc. 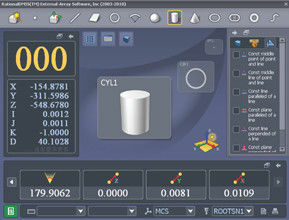 RationalDMIS PC: operator can achieve some advanced function, CAD drawing management, CAD input and output, DMIS programming, multiple reports creating.